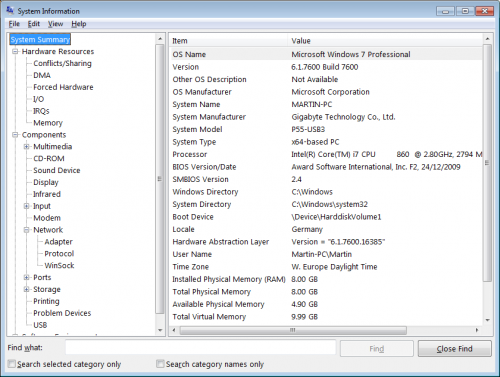 Coolmon is a great little freeware application that monitors and displays various windows settings. Among the information that can be displayed are Processor usage (up to four CPU's) , Number of Processes , Number of Threads, Process using the most CPU time , Processor type , Used/Free/Total page file , Used/Free/Total RAM , Free/Total/Grand Total Disk space (up to sixteen disks, also mapped network drives) , Computer Uptime , Date & Time , Computer name , User name , All IP addresses , Network read and write speed (up to four NICs) , Total Bytes sent and received and Battery status. Notify is a small freeware application for windows that monitors files and directories that you specify and notifies you when those are changed. The small size of 15 Kb makes it an ideal background task, it uses almost no cpu time and little memory. Tweakguides have a large article about firefox tweaking which not only explains the basic settings of firefox but also advanced settings which can be edited by entering about:config in the firefox address bar. The guide is divided into 12 chapters and starts with an introduction which helps you get in the right mood for the article. After that the optimization chapters begin with chapter 2 essential optimization and an explanation of many basic firefox settings. You learn a lot about firefox and those early chapters are clearly aimed at novice users who did not put much thought into the configuration up to now. Most people think it takes lots of work to encrypt files. 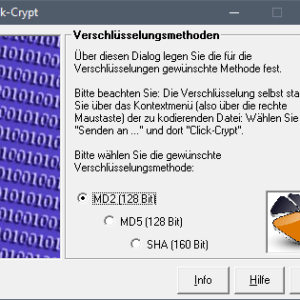 The freeware click crypt 2.6 allows to encrypt and decrypt files with just one click. It´s unfortunatly only available in german but that does not matter a lot because the interface is simple and easy. Click on Download Sofort ausführbares Setup which starts the download. After that install the software on your system and start it. This opens a configuration window which is named Verschlüsslungsmethoden. You select the encryption algorithm that you want to use, you have three options, those are: MD2 (128bit), MD5 (128bit) and SHA (160 bit). Todays world is becoming a wireless one. If you signup for a new internet provider you have most of the time the choice of a modem that uses cables and one that is wireless. Now, most people tend to chose the wireless one because their homes don´t look that messy after all, cables everywhere seems to turn certain people off quite a bit. Lot´s of people complain that webproxys are not working at their works / schools computer because they have been banned by administrators. A way around this would be to setup your very own proxy server that is being hosted a) by a free webhosting service that supports either php or cgi or b) your own website that is being hosted by a webhosting company. I don´t think a lot of my visitors are still using the Microsoft Internet Explorer but there are some that do. My first advice would be to change the browser immediatly to firefox or opera, for those who are to lazy or have other reason to keep the insecure browser the IE Proxy Changer is a nice little addition to the internet explorer. Igowerf from the anandtech forum posted a rather large list of freeware that can replace commercial products from the same category. For example a replacement for Microsoft Office would be of course Open Office which is free to download and use. It is a great list with lots of different categories that include Office, Internet / Networking, Graphics, IDE's and editors, Audio/Mp3/CD, System tools, Video encoding/decoding/etc, 3D Modeling/Animation/etc and Misc suggestions. Now this is an interesting analysis of password recovery speeds. It compares password length and chars used to the time different computers need to bruteforce the password, ranging from Class A (speed of a pentium 100) to Class F (supercomputers, large scale distribution) computers. Dylan Tweney compiled a list of 101 fabulous freebies for the pcworld website. The link above leads to the category view of all freebies that dylan collected. Categories include Tune Up: Utilities and system tools, Lock It Up: Security/antispam tools, system-stabilizing utilities and Share It: File sharing and storage services. All categories include program links and a short description of the program itself. Lots of known tools but also some lesser known ones and also some services are included. JDiskReportenables you to understand how much space the files and directories consume on your disk drives, and it helps you find obsolete files and folders. The tool analyses your disk drives and collects several statistics which you can view as overview charts and details tables. This is a great tool if you are looking for a program that analyses your hard drives content. Shows lots of useful information like which filetypes use the most space on your hard drives, file modification and folder size. Maybe you are like me, thinking why there are so many linux distributions out there and what the differences between them are. It´s hard to make a selection, there are hundreds of distributions out there and all seem to serve a purpose. This could have been the intention of the guys who wrote the overview of the ten major linux distributions. Well I came upon this analysis of .com domain names in this article by Dennis Forbes called Interesting Facts About Domain Names. He takes a look at .com domains only because this is the most thought after domain extension worldwide. Some interesting conclusions that he draws are that the chances of catching a two or three letter domain name are exactly zero, unless you pay a brooker for it of course and that the chances to register a short domain name start with four-letter domain names. I´ve written about virtual computers before and found a nice way program to make the same method available for virtual software installations. Altiris Software Virtualization Solution lets you install every kind of software in a protected environment that prevents access from this software to your core system. This is great if you want to try out some new alpha / beta software or software that you are suspicious about. It has been a long time since I wrote the first article about Disposable Email Address Services and I think it is time to update the old article with new services and get rid of dead ones. Before I start listing several websites and services that allow you to use "one-use" email addresses I will shortly explain why everyone should have at least one service at hand all the time.